Ani Phyo's Veggie Girl Power Interview! Today's inspiring Veggie Girl Power lady is raw food book author and chef Ani Phyo! Four words I'd use to describe Ani: creative, charismatic, talented and vibrant. Get to know Ani!.. 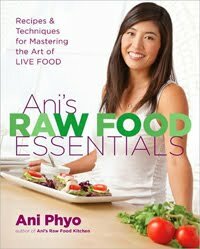 Ani Phyo is one of my favorite raw food authors. Many at-home cooks (omnivores and vegans!) are mystified by raw food cooking. Nuts, seeds, coconut oil, dehydrators, vegetable noodles, raw bread, kale chips, algae and more can leave the average at-home cook overwhelmed and ready to reach for the microwave! ..But it's authors like Ani that bring us into the light and truly make it all "look easy" - and most of the time raw food 'cooking' is actually easier than we think! Ani: Matcha, maca, cacao, spirulina, moranga smoothie made up of some or all of these ingredients. Ani: Sea Vegetables and blue green algaes like cholorella. Ani: Connecting our children to their food sources and the earth. Ani: Meat just grossed me out, it was too close to human flesh, I didn't like the taste or texture. Ani: Power balls made of ground flax, cacao, mesquite, maca, almonds, splash of water to hold it all together, sometimes I add gojis. Ani: Surprised to discover how many prepared foods use meat stock or even for example bacon fat in hummus! Always ask how food is made before ordering. I tell people I have an allergy, this makes them take it seriously. Ani: Gratitude and counting our many blessings. Ani: Everyone has their point of view. We all have unique paths in life. It's their opinion, they're entitled to having an opinion. I like to try my best to take them into consideration to help me grow. I actually love and welcome criticism. Ani: Be happy, have gratitude, be love. Ani: Stella McCartney for creating vegan fashions I love. Ani: Take food with me to gatherings that I want to eat, make extras to share with everyone else.